Many of the commercial production processes for organic acids are excellent examples of fungal biotechnology. However, unlike penicillin, the organic acids have had a less visible impact on human well-being. Indeed, organic acid fermentations are often not even identified as fungal bioprocesses, having been overshadowed by the successful deployment of the β-lactam processes. Yet, in terms of productivity, fungal organic acid processes may be the best examples of all. For example, commercial processes using Aspergillus niger in aerated stirred-tank-reactors can convert glucose to citric acid with greater than 80% efficiency and at final concentrations in hundreds of grams per liter. Surprisingly, this phenomenal productivity has been the object of relatively few research programs. 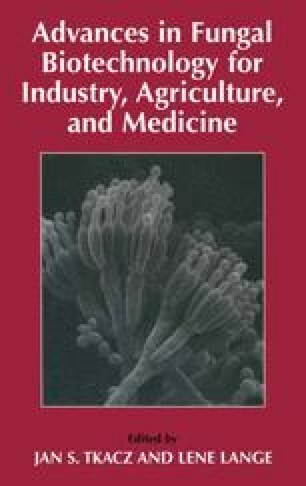 Perhaps a greater understanding of this extraordinary capacity of filamentous fungi to produce organic acids in high concentrations will allow greater exploitation of these organisms via application of new knowledge in this era of genomics-based biotechnology. DOE Joint Genome Institute (2002). JGI Programs: White Rot Genome Project. ; http://www.jgi.doe.gov/programs/whiterot.htm. TIGR (2002). The Aspergillus fumigatus genome database; http://www.tigr.org/tdb/e2k1/afu1/.